Last year I wrote a post about my no-fail strategies for keeping houseplants alive. My biggest and bestest tip? Nothing. Seriously. The best way to keep most common houseplants alive is to just ignore them. (And give them a good soak when they are really dry) It’s really that easy. My tip must work because all of the plants I featured in that post are still alive a whole year later. Yahoo!! Today I wanted to share with you my new, biggest crush: the air plant. A few years ago, you may have seen these being sold in random mall kiosks. I know I did but I walked right on by. Recently I have been seeing air plants pop up all over the place. I love their sculptural look and their ability to grow anywhere without needing any soil. Brilliant, right? Like their name implies, air plants grow by sucking nutrients they need from the air around them and by receiving a good soak every week or so. Another perk? They’re inexpensive. I bought my air plant from a local nursery, Creekside Gardens, for about $2! You can also find them at big box home improvement stores too if you don’t have a local nursery to support. At Christmas time, I tucked her into this planter with greens and eucalyptus, like a crown jewel at the top. Air plants like a little light to brighten their day. Not necessarily direct light, but they won’t thrive in a windowless bathroom or a very dark room. 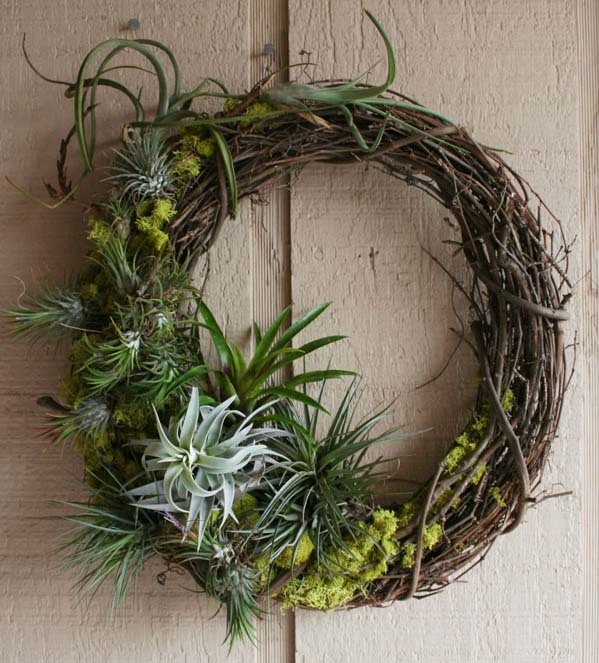 This wreath combines air plants and some moss too. Of course this would need to be inside because it’s still winter! Boo! But would look lovely on a wall in your house. I love the repetition of the 3 air plants tucked in the wooden crate. I imagine this brightening up the corner of a kitchen counter or on an entry table or sideboard. 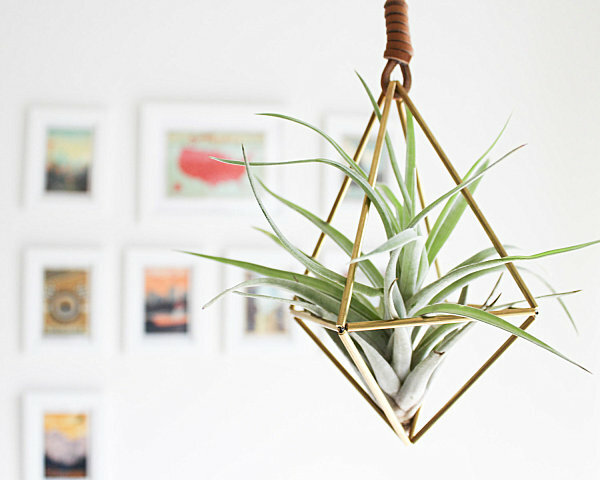 This hanging air plant is soooo cool! This would be any easy DIY with any kind of metal geometric object and a leather lanyard. I think I definitely will be trying this one. I bet an air plant would thrive in my kids’ bathroom. The steam from the 30 minute showers would probably negate any additional watering on my part, right? But all joking aside. Seriously. Anybody — even you! can keep a plant alive and I think an air plant is the perfect plant to start with, don’t you?